Please call us first at (609) 259-3316 to schedule an estimate so that we can provide you with our undivided attention. 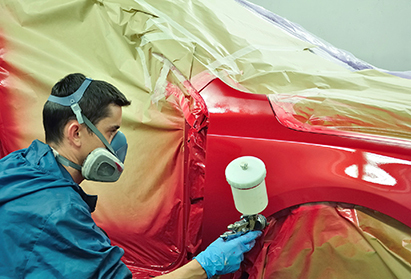 Allentown Auto Body Provides a full line of Auto Body and Painting Repair services. We have a state of the art USI Eurotech Downdraft Paint Booth which will be giving you a baked on finish. This will match your factory finish that is already on your vehicle. This paint booth was imported from Italy and provides you with the best possible quality of paint finish for your vehicle. Allentown Auto Body also provides a full line of welding equipment and windshield replacement on premises when damaged due to Auto Accident. Black Hawk frame machine which is equipped for all full framed vehicles. Allentown Auto Body is a Carco Photo Inspection Site. It is suggested that you call ahead for availability, however no appointment is necessary. If your broker/agent provided an authorization form, please bring it with you. Paperwork is NOT required but is helpful. This brief inspection should NOT be confused with a 'SAFETY' inspection. For further inspection assistance call us at: 609-259-3316.
vehicle upon completion of Auto Body repair. to schedule an estimate so that we can provide you with our undivided attention. To provide all of our valued customers with the time required for an estimate please call ahead to schedule. Allentown Auto Body, L.L.C. ©2015 copyrights.